WELLINGTON, Fl., April 3, 2019---Teams and rosters were announced for the much-anticipated Sunny Hale's Legacy Women’s Championship Tournament (WCT) Finals Saturday at Grand Champions Polo Club. The only women’s polo event of its kind and largest polo league in the world, now in its 13th year, was created by Hall of Famer Sunny Hale, who has done more for women's polo than any player, past or present. The WCT Finals has attracted players from throughout the U.S. and internationally including 10-goaler Nina Clarkin of Great Britain. The open division features WPL (Delfina Blaquier, Mili Sanchez, Mia Cambiaso, Nina Clarkin) and San Saba (Dawn Jones, Sarah Siegel, Lia Salvo and Clarissa Echezarreta). The 16-goal division features Blue Pegasus (Mia Bray, Millie Hine, Alyson Poor, Jennifer Williams) and Melinda's Prospect (Malia Bryan, Cindy Halle, Anna Winslow, Kylie Sheehan). The day kicks off with pre-game ceremonies at 12:30 p.m. Games are 12:35 p.m. and 1:30 p.m. with the awards ceremony at 2:45. There will be catering served for players, family, friends and fans from 12:30-3:30 p.m. In last year's event open final, Chateau D'esclans won the title with a 7-3 victory over CrossFit El Cid. 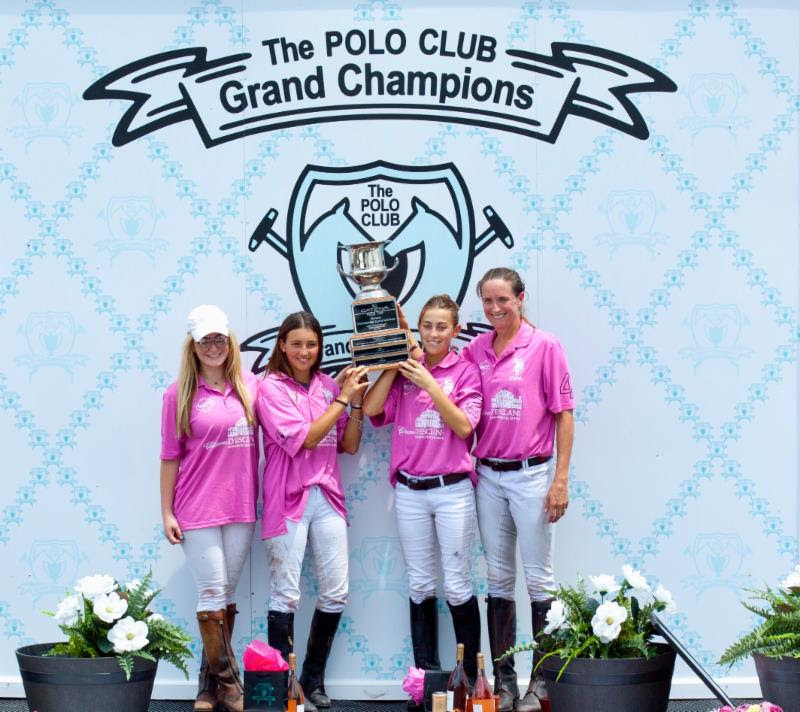 Tournament MVP and Captain MVP Nina Clarkin was joined by three talented teenagers, two-time Argentine Open champion Mia Cambiaso, the game MVP; Mia Novillo Astrada and Riley Ganzi. "It's exciting to see such talent coming through and that I can be here to help them along the way," said Clarkin after accepting her MVP award. "They are young, talented players with big futures. They were great teammates. I think Sunny would be really pleased how far the polo has come and what sort of talent is here." The tournament is named in honor of legendary Hall of Famer Sunset "Sunny" Hale. The largest polo league in the world has grown in popularity since its inception in 2005. The WCT Finals, which started in 2006, has adult and junior qualifiers for U.S. and international players with more than 20 qualifiers in the U.S. alone including this year's Susan G. Komen Women's U.S. Open, won by Hawaii Polo Life. This year tournament hosts Marc and Melissa Ganzi waived fees for players and umpire fees to attract a good turnout of players in honor of Hale's legacy. "This was Sunny's mission, to create a women's polo venue where the girls could bring their polo up," said WCT Ambassador Joanne Smicklas. "She remains an inspiration to other women who are determined to achieve their goals with grace and dignity. The players are so excited to play in the WCT for Sunny's legacy, they loved her and want to support everything she did for them getting to play this level of polo." Catena USA is the official timepiece of the WCT Finals, the official recognized event of the American Polo Horse Association, which Hale also created. Catena USA president and CEO Bill Kraft will present awards including the coveted Catena Polo Cup. Hale said Grand Champions has played an integral role in the WCT’s success. “The fact the WCT Finals are in Wellington during the U.S. Open sets the whole stage,” Hale said. “Women are inspired to play here. Grand Champions does a fantastic job. What it does for the WCT is it brings legitimacy to the fact they put on a great show, they’ve got great fields and you are right in the center of everything. Women's polo remains the largest growing sector in polo, aided by the WCT Series which has helped consolidate women's polo and promote high quality competition throughout the world, along with the newly-formed WIPN (Women's International Polo Network). Grand Champions tournaments attract a large international field of players from all corners of the world including India, Mexico, New Zealand, Chile, Costa Rica, Argentina, Canada, Ecuador, Brazil, Switzerland, France, Germany, Uruguay, Azerbaijan, Australia, South Africa, Nigeria, Venezuela, England and the U.S. The Polo School, a stand-alone USPA-sanctioned polo club, is dedicated to teaching polo to all ages, particularly grass roots youth. Its mission is to provide individuals opportunities in polo at every economic and ability level. Scholarships are available. The Polo School operates in Wellington January through May and September through November. Headed by Director of Operations and former 8-goaler Juan Bollini, The Polo School has nurtured several men and women polo players now playing in the pro and amateur ranks since its inception.